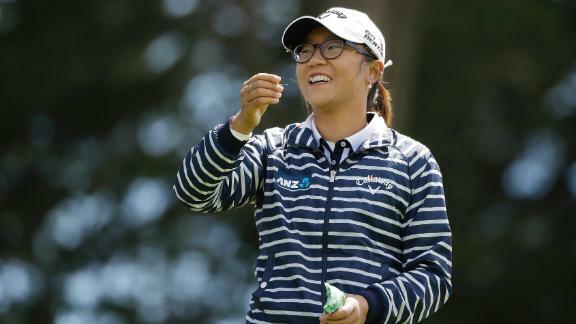 Cary Chow catches up with Lydia Ko, who recently won her first professional LPGA title and was named one of Time magazine's 100 most influential people. Way back when Lydia Ko was just 15, in early April of last year, the next big thing in women's golf was making her idol, Michelle Wie, feel "really old" and then-No. 1 Stacy Lewis really jealous. "I think she's kind of -- ignorance is bliss," Lewis said of Ko. "I don't think she realizes how good she is. ... [It's] just kind of the way she is. She's just very calm and relaxed." Lydia Ko's third LPGA victory -- her first as a pro -- was enough to catapult her to the No. 2 ranking. On Sunday, three days after turning 17, Ko cruised past Lewis by one stroke with a 6-foot birdie putt on 18 to win the inaugural Swinging Skirts LPGA Classic in Daly City, Calif. Afterward, Ko credited Lewis with giving her the extra motivation necessary to win her third LPGA victory and first as an LPGA Tour member. "When I just see [Lewis] play, [it] makes me feel like I need to play good to kind of keep up with her," Ko said in the news conference afterward. "She's such a great player, and I admire her all the way. ... Someday, I want to become a great player just like her." It would be easy to argue Ko is already there, having vaulted over Lewis to No. 2 behind No. 1 Inbee Park in Monday's Rolex women's world golf rankings. It has been practically an embarrassment of riches lately for the LPGA, which has crowned three different champions with great storylines in the past three tournaments -- 19-year-old Lexi Thompson in the year's first major at the Kraft Nabisco, Wie winning her first LPGA event in four years in her native Hawaii and now Ko. Ko is especially exciting for women's golf, fulfilling the promise predicted by anyone who has seen her swing a club since she was 13. A native of New Zealand, Ko won two LPGA titles as an amateur and five pro events worldwide. And, oh yes, she also was named one of Time magazine's 100 most influential people in the world earlier last week. I won here. I finally turned 17. I've been 16 for a long time. You know, the top 100 most influential people. I don't know what I've done to get there but, yeah, it's just a really special week for me. "I won here," she said. "I finally turned 17. I've been 16 for a long time. You know, the top 100 most influential people. I don't know what I've done to get there but, yeah, it's just a really special week for me." Drawing comparisons to Tiger Woods, who didn't win his first PGA title until age 20, Ko should be a favorite throughout the summer schedule, including, most notably, the U.S. Women's Open in June, the British Open in July and the LPGA Championship in August. One of the most fundamentally sound players and best putters in the game already, Ko's skills lend themselves to consistency, and now, competitive toughness founded from three tour victories also makes Ko dangerous. Throw in the incredible calm that Lewis described and it's a bit scary to consider Ko's future, something even Ko seemed to understand Sunday. Ko edged out both Lewis and Jenny Shin, setting up her birdie putt on 18 with a textbook pitch from the rough. "Luckily, I didn't have a severe breaking putt,'' Ko said. "I had to just trust it, and that's all you can do at that point." With instincts to go along with the touch and feel of a veteran player, Ko is still a kid, and an extremely likeable one at that, crying with joy Sunday in her first words after the win because her father, who rarely gets to travel with her in competition, was able to see her play. "I try and make myself not cry of happiness, but it was coming to that point," she said, trying to explain herself. There was no need. She's one of the best stories in all of sports right now, and that alone is worth a few tears.